A portable multi gas detector can detect simultaneously up to 6 gases depending on its configuration. The most commonly used device is the 4 gas monitor (combustible gas, O2, C0 and H2S). This configuration is primarily used in water treatment, in the steel industry, for construction and public works, or for confined space entry. 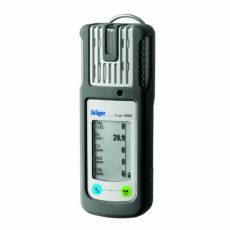 A portable multi gas detector is designed for one goal: to guarantee health & safety at work by gathering information about the quality of the work environment. Thus, a multi gas detector can monitor from 1 to 6 gases simultaneously depending the unit. Compact and lightweight, multi gas meters are more expensive than single-gas detection equipment but feature enhanced functions such as data recording (gas concentration, alarm events), computation of average values &amp; exposure limits, or events traceability. The 4 gas monitor is the prime portable multi gas detector and the most commonly used in the industry (water and waste treatment, public works, steel industry, confined space entry …). It can simultaneously detect combustible gases (natural gas, LPG, hydrocarbons, alcohols and solvents), hydrogen sulfide (H2S), carbon monoxide (CO) and oxygen (O2) deficiency. For other less mainstream configurations, portable multi gas detectors feature a wide range of additional gas sensors including plenty of toxic gases (ammonia, chlorine, chlorine dioxide, hydrogen chloride, hydrogen cyanide, sulfur dioxide, nitrogen dioxide, nitric oxide, phosphine…), volatile organic compounds (VOC) and carbon dioxide. Larger than a classic portable multi gas detector, this device is not a personal protective equipment but is known as an area protective unit. An area gas monitor is designed to ensure accurate gas detection on a defined zone. Workers can thus easily and safely evolve on a canvassed secured field, and be alerted as soon as a dangerous gas is detected. (see the The LENS wireless technology). With a large autonomy (up to 168 hours) and easily carried, area gas monitors can now also communicate wirelessly with other units to enlarge the monitored area. These safety units are able to detect the classic gas range of a portable multi gas detector (combustible gases, O2, CO, H2S). For more specific usage and requests, a wide range of gas sensors and configurations remains available. Almost any single-gas and portable multi gas detector sold by GazDetect is available with our 2-year All Included Maintenance program (in selected locations). This service was created to forecast the calibrations and the periodical maintenance of your gas detection equipment for two years from its purchase date (about 100 euros for a classic 4-gas monitor). At the end of these two years, the All Included Maintenance service can be renewed for two more years and so on... At GazDetect we designed this program to help you manage your devices and help you maximize your safety level. The X-am 5000 portable gas detector represents an ideal solution for individual protection and monitoring of combustible and toxic gases as well as oxygen. Small and lightweight, this multi gas detector can simultaneously detect the presence of 1 up to 5 gases. The X-am 5000 5 gas monitor is the world’s smallest handheld multi gas detector. This personal safety equipment has been especially designed to accurately and reliably detect the presence of combustible and toxic gases, amines and organic vapors but also to monitor the presence of oxygen in ambient air. With its ultra-compact size and its low weight, the X-am 5000 monitor is easy to wear, attached to a pocket or directly on a collar in order to measure concentrations inhaled by its users. This device features two buttons to navigate the intuitive and user-friendly menus. The interchangeable Ex catalytic sensors used in this detector can be easily replaced for use in a large number of applications. These sensors are engineered for measures from the lower explosive limit (LEL) up to 100% of the volume. Because they are interchangeable, these catalytic gas detection sensors can be easily replaced. The user can also add sensors to upgrade a detector in order to detect new gases. Moreover, these sensors feature excellent stability and enhanced resistance against poisons like hydrogen sulfide or silicon. Their lifetime can exceed 4 years. In compliance with the IP67 standard, the X-am 5000 5 gas monitor is airtight to dust and water. Thanks to its rubber housing, this detector is also resistant to shocks, vibrations and impacts in order to be used in the most difficult environments. Thanks to an optional external pump, the X-am 5000 can also be used to draw remote samples up to 30 meters away. This pump can be easily and quickly mounted and removed and requires no tool. This way, operators can easily switch from diffusion mode to pump mode in order to control the presence of hazardous concentrations of gases before any intervention in confined space – for applications in tanks for example). Lastly, the X-am 5000 portable multi gas detector is available with two power supply opportunities: either with alkaline batteries or with a rechargeable T4 battery. Furthermore, its integrated data logger can store up to 1,000 hours of data per interval of one minute. Ultra-compact and lightweight, the X-am 5600 multi gas meter has been especially designed to detect the following gases: O2, Cl2, CO, CO2, H2, H2S, HCN, NH3, NO, NO2, PH3, SO2, amines, odorants, COCl2, ozone and different organic vapors. The X-am 5600 portable multi gas detector is a personal protective equipment that has been especially designed to simultaneously detect from 1 up to 6 gases. Thanks to an innovative combination of infrared and electrochemical gas detection sensors, this portable gas detector can quickly, reliably and accurately detect the following gases: O2, Cl2, CO, CO2, H2, H2S, HCN, NH3, NO, NO2, PH3, SO2, amines, Odorants, COCl2, Ozone and different organic vapors. The X-am 5600 has been designed to combine performance and discretion. This way, thanks to a compact size and a light weight, it won’t annoy its user. Easy to wear and to use, this portable multi gas meter is robust and can be used in hostile industrial environments. IP67 certified, it is resistant to water and dust. 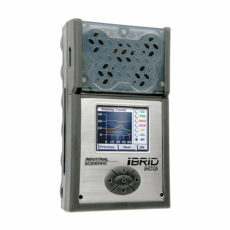 Moreover, thanks to its rubber housing, this personal gas monitor features an increased resistance to impacts and shocks for use in difficult conditions. As it also features a crocodile clip, it can be easily be attached to a pocket or a collar in order to monitor concentrations inhaled by the operator. The X-am 5600 multi gas meter can monitor up to 6 gases thanks to electrochemical and infrared sensors. Because of their huge durability and resistance, infrared gas detection sensors can operate for up to 8 years and only require one annual calibration. Thus reducing maintenance and operating costs. This way, this detector can be equipped with an IR Ex sensor to monitor combustible gases (with a measuring range between 0 and 100% of the volume for methane, ethylene and propane for example), an IR CO2 sensor to detect carbon dioxide or an electrochemical sensor for hydrogen detection. When equipped with an external sampling pump – available in option – the X-am 5600 can draw remote samples up to 30 meters away in order to get hazardous gas concentrations before any intervention. This system is very convenient before any entry in confined spaces like tanks or pits. Lastly, this lightweight and compact detector is ATEX approved for use in zone 0 - continuous explosive atmosphere. The Radius BZ1 is a high performance area gas monitor. As it is made with rough materials, it suits in the most demanding ATEX standards and the harshest environments. Detection of combustible gases, Cl2, CO, H2, H2S, HCN, NH3, NO2, O2, SO2 and VOC. Designed in an impact and weather-resistant polycarbonate alloys housing, the Radius BZ1 area gas monitor is an extremely flexible solution to monitor a clearly defined area or a confined space. Moreover, the Radius BZ1 area gas monitor is equipped with the DualSense technology and is available with optional LENS Wireless technology. DualSense technology uses two sensors of the same type to determine the concentration of a target gas in the atmosphere and reduce the risk of instrument failure while improving gas reading accuracy. LENS is the first wireless gas detection solution that allows personal monitors and area monitors to communicate gas readings and alarms with one another. Thanks to the 360-degree gas path and all-weather sensor use, the Radius BZ1 area monitor can accurately detect gases regardless of environmental conditions and avoid false alarms. The special nature of this gas detection area monitoring device lies in its SafeCore® module. This unit concentrates every critical technology pieces such as software, pumps and sensors. this module can be easily removed to be placed in any base in order to have a smaller fleet of instruments, easily dock it on a socking station – to download data logs and alarm events, bump test, calibrate and change settings – or to adapt each configuration to changin environment. In case of anormal concentrations, powerful audible (108 dB at 1 m) and visual (ultra-bright blue and red lights) alarms will alert any operator working in the area, even in high-noise and dark environments. Custom alarm action messages like “EVACUATE” or “VENTILATE” can furthermore be configured in case of emergency situations in order to quickly and safely take corrective actions. Lastly, the Radius BZ1 area gas monitor is equipped with a long-duration battery with 7 days (1168 hours) or typical runtime. An optional external extended battery can extend it over one month. 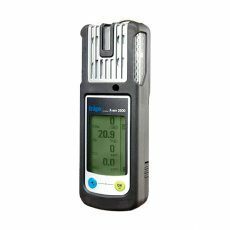 The X-am 2500 portable 4 gas monitor has been especially designed to accurately monitor concentrations of 1 up to 4 gases: combustible gas (0 - 100% LEL) oxygen (O2), carbon monoxide (CO), hydrogen sulfide (H2S), nitrogen dioxide (NO2) and sulfur dioxide (SO2). The device is guaranteed for 3 years. Especially designed for use in hazardous atmospheres, the X-am 2500 portable multi gas detector is ATEX approved for zone 0 (permanent explosive atmosphere). 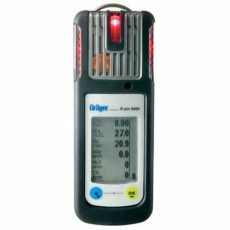 This small 4 gas monitor can accurately and reliably detect the presence of up to 4 gases among O2 (oxygen), CO (carbon monoxide), H2S (hydrogen sulfide), NO2 (nitrogen dioxide) and SO2 (sulfur dioxide). The powerful tiny sensors of the X-am 2500 multi gas detector allow safe and reliable detection of hazardous gases concentrations. Thus these high performance gas detection sensors are ideally well-suited for industrial applications and refineries. Moreover, thanks to their unique design, these gas detection sensors feature a long-lasting shelf life – up to 5 years for O2, CO and H2S sensors. This high sensor durability then enables reduction of gas detection related operating costs. Thanks to its compact and lightweight design associated to a robust crocodile clip, the X-am 2500 portable 4 gas monitor can be easily and comfortably worn on a belt or on a collar without disturbing the user. 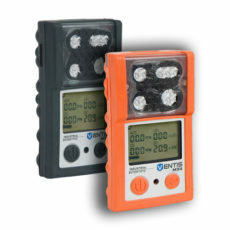 Moreover, this portable multi gas detector features several gas entries on the top and on the front in order to properly operate even if the device is inside a pocket or if one of the entries is accidentally covered. As a safety device against potentially dangerous gas concentrations, the X-am 2500 has a 3 years guarentee to ensure maximum security to its user. The X-am 2500 portable gas monitor features a large easy to read LCD display. All of the target gases are simultaneously displayed on the screen and once a gas alarm occurs, the hazardous target gas is highlighted for fast recognition of the hazard. The ultra-bright visual alarm can be seen at 360° and is coupled with acoustic 90 dB at 30 cm and vibrating alarms. An optional gas sampling pump is available to draw remote samples up to 30 meters in order to get sure of gases concentrations in confined spaces like tanks or pits before any intervention. This gas sampling pump, designed for this 4 gas monitor, automatically triggers upon the device start-up and it is very easy for the user to switch from pump mode to diffusion mode without any tool. VENTIS-MX4 portable gas detector that complies with ATEX standards. 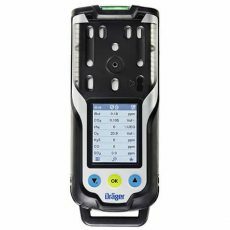 This detector can detect from 1 to 4 gases with a large range of sensor combinations (Explo 0-100% LEL, O2, CO, H2S, NO2, SO2). The Ventis-MX4 is a portable multigas detector. Contrary to single-gas detectors, it can detect up to 4 gases. Thanks to its rechargeable Li-ion battery, it can continuously operate during around 12 hours at 20°C ambient temperature. This battery can be replaced by an optional extended battery for up to 20 hours of autonomy without pump. The Ventis-MX4 portable gas detector can detect up to 4 gases amongst explosive gases, oxygen (O2), carbon monoxide (CO), hydrogen sulfide (H2S), sulfur dioxide (SO2) and nitrogen dioxide (NO2). A specific location is dedicated to the explo sensor (catalytic sensor) and the oxygen sensor (electrochemical sensor). A 4 gas unit will basically include oxygen and explo sensors. The Ventis-MX4 features 3 different alarms. 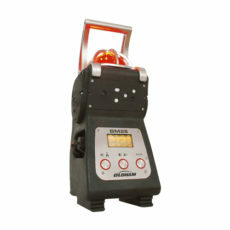 The first one is a powerful 95 dB at 30 cm audible alarm to alert in noisy environmets. A high visibility red LED visual alarm and an ultra- vibrating alarm are added to improve safety. Two alarm levels are configures: low and high alarms – which are basically calibrated under occupational safety at work data. The Ventis-MX4 portable gas detector also features the same physical properties – dimension and weight – than a single-gas detector. It can be wore close to the breathing tracts thanks to its crocodile clip without disturbing the user. This multigas detector shock-resistant and waterproof thanks to its high visibility polycarbonate-made overmold. As this device can detect explosive gases, it meets current EU ATEX standards (explosive atmosphere). A sampling pump – VSP for Ventis-MX4 – is available to draw remote samples (up to 30 meters) before interventions – e.g. in confined space. The Ventis Pro5 detector is equipped with new features such as a panic button to improve safety of workers evolving in hazardous areas. Detection of the combustible gases, NH3, CO, CO/H2S, H2S, HCN, NO2, O2, SO2, CO2, HC. The Ventis Pro5 multi gas detector was especially designed to silmutaneously detect up to 5 gases among the combustible gases, NH3, CO, CO/H2S, H2S HCN, NO2, O2, SO2, CO2 and HC. This flexible detector features a panic button to alert nearby teams when user is in distress. It also features a mandown alert function which is set to activate after a defined period of time without motion. 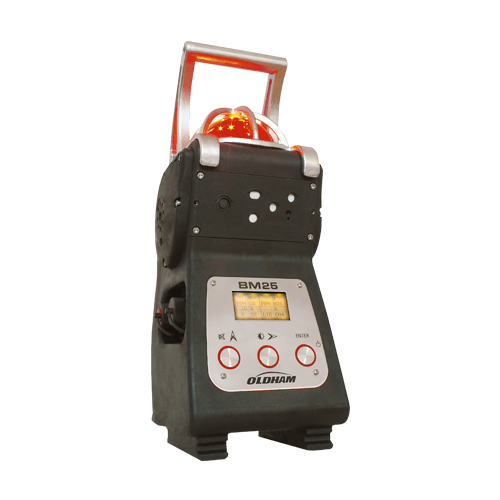 In case of anormal concentrations, powerful audible (95 dB à 10 cm) and visual (ultra-bright blue and red lights) alarms will alert any operator working in the area, even in high-noise and dark environments. Custom alarm action messages like “EVACUATE” or “VENTILATE” can furthermore be configured in case of emergency situations in order to safely and quickly take corrective actions. 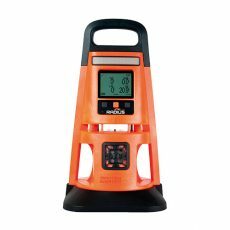 Made of polycarbonate with protective rubber overmold, this gas detector is available either in black or high-visibility safety orange versions and can be combined with the VSP slide-on pump. Its integrated data logger can record up to 3 months of events. Water and dust-resistant (IP68), the Ventis Pro5 can be used in pumped version for use in confined spaces or without pump as a personal protective equipment. 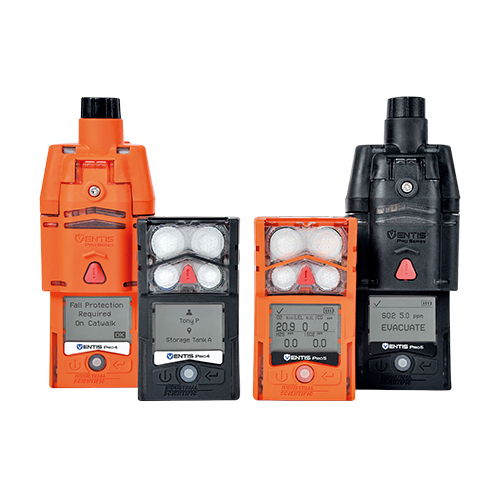 The Ventis Pro5 portable multi gas detector also features the LENS Wireless technology. LENS is the first wireless gas detection solution that allows personal monitors and area monitors to communicate gas readings and alarms with one another. This way, panic and mandown alarms will be communicated to other Ventos Pro detectors operating in the same area in order to alert everyone on the hazardous situations. Lastly, the Ventis Pro5 benefits from the iAssign® technology for site and user follow-up. Thanks to this enhanced technology, every data recorded by the device will be assigned to the user ID. This process allows amongst other things users to wear several gas detectors within the same working day.